Ready for Skiing? Kids Get the Hookup this Season! There’s something about this time of year that gets me a little more excited than usual. Perhaps it’s all of the ski sales, the chill in the air or the pictures I see on Facebook of the snow dusting the western peaks. This year has me a little more excited because I know I’ll get to ski more with my kids. Now, you may be thinking skiing with your kids? That is a challenge, but last year they crossed over from learning to actually skiing. If you ski with your kids, you understand what I am talking about. I can comfortably call them skiers. This means that I can ski with them without being terrified of them getting out of control and crashing into someone or worse a tree or pole. All I have to worry about now is that day when they out ski me. And thanks to the incredible pass opportunities for kids, we can ski at a relatively low cost this year. Skiing as a family comes with an enormous cost but with the Epic Schoolkids Colorado Pack and the 5th and 6th Grade Colorado Passport Program, elementary school kids have the opportunity to ski for free! This pass gives kids in grades K-5 free access to Vail, Beaver Creek, Breckenridge and Keystone. Your children will get four days at each resort. Considering how busy schedules can be, it is quite a bit of free skiing for kids. Your kids don’t ski, but want to try? This pass allows your kids to get a FREE first-timer lesson and rental in January. You have to hurry; this pass is only available until October 11. Click here to learn more about this opportunity. If you have a fifth or sixth grader, pay attention! This pass program is for you. 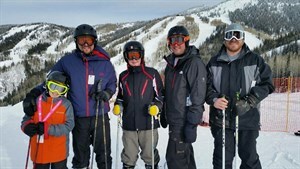 It is an incredible opportunity to get your kids on the slopes. This pass is from Colorado Ski Country USA and gives fifth graders the chance to ski FREE at 20 resorts. They can ski A-Basin, Aspen, Crested Butte, Loveland, Monarch, El Dora, Steamboat and more. Like the Epic pass, if your kids haven’t skied before there’s an opportunity to get a free lesson in January. 6th graders get practically the same pass for just $99. There are just a couple of differences from the fifth grade version that you will want to take note of when signing up. Regardless, when you are talking ski passes, it is a great deal. Click here to sign your child up or to learn more about the 5th and 6th grade Colorado Passport Program. The temps might be in the 80’s and 90’s here in The Meadows, but in the high-country they’re dipping and it won’t be long before the snow flies and I cannot wait! Get your skis ready, get your kids’ passes and hit the slopes this winter.